It will be a fun year with this crew, representing Easterseals Arkansas at various events throughout the year. Philip continues on as our Adult Rep, with Kala'Bria as the new Grand Prairie Child Development Center Rep; Griffin (wearing glasses) as the new Child Rep; and Zack Gridley, who is continuing his second term as our Youth Rep! Our representatives serve two-year terms, which are staggered like our Board of Directors terms. They happily represent us at events, corporate partner visits and in the media. Griffin is known around here as the boy with the cool glasses. 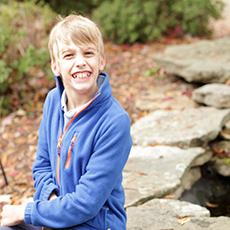 He was born with a rare genetic disease, Leber's Congenital Amaurosis (LCA), which affects vision, but hasn't let that slow him down from enjoying life to 100 percent. 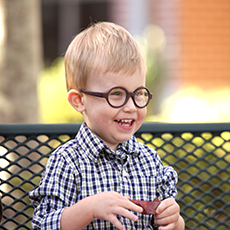 As aresult of his lack of vision, Griffin currently receives occupational, physical, and speech therapy services to help him learn to thrive in this very sighted world that we live in. Griffin loves his teachers and therapists at Easterseals and was a key player in raising funds through his Walk With Me team this past summer! 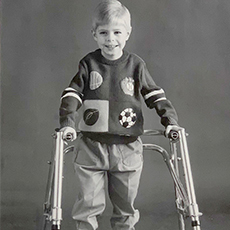 Easterseals has been an ongoing blessing to Griffin's family, says his mother, Cary, who is a therapist at Easterseals. "We feel so privileged that Griffin has been so loved and accepted here, and feel so indebted to the staff that works with him daily." Born at 28 weeks, Kala’Bria only weighed 2.4 pounds and spent well over five months in the hospital before ever coming home. She began attending our Stuttgart preschool in October of 2015. 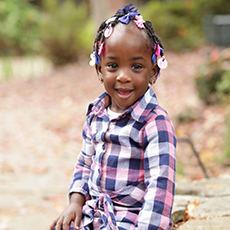 When she first came to Easterseals, Kala’Bria couldn’t even sit up by herself. 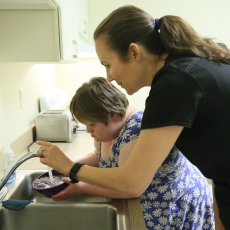 Before long, after receiving physical and developmental therapies, she surpassed the crawling stage and went straight to walking. 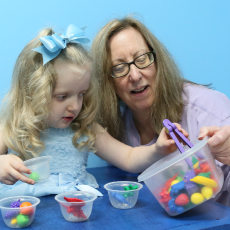 Now, she receives speech therapy and is improving in that area as well. Kala’Bria is like many other little girls. She loves to dance, sing and play with her baby dolls, and we’re happy to have her as our Grand Prairie Child Development Center representative! 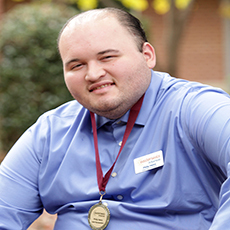 One of our most enthusiastic youths, Zack has been receiving services at Easterseals since he was a baby. 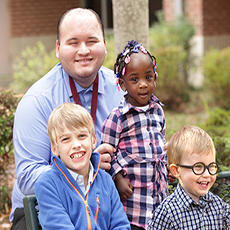 Most recently, he helped coordinate our in-house pie-in-the-face fundraiser for Walk With Me. He had the most fun smudging pies in the “winners’” faces. He carries over his leadership skills at school where he’s part of the jump rope team and Klondike Leadership Academy, which focuses on students doing community service and other activities independently. We are honored to continue having Zack as our Youth Representative! Originally from Okalahoma, where he graduated from Broken Arrow High School in 2009, Philip earned various art awards and accolades in national choir competitions. He was one of the Oklahoma Governor’s ambassadors of music in 2009. Philip lives in one of our apartment communities – Wilson Court II – and has attended the Center for Training & Wellness since 2014. He excels at art, and his artwork has been sold in our Art & Soul event. Philip is a big Oklahoma University fan and loves to hang out with his friends and family. A goal of his is to one day be part of our college program with UA Little Rock, ACCE, and have a part-time job. He strives every day to be more social and independent.